I live minutes from a shopping mecca in the suburbs. As I passed in and out daily I noticed a new building emerging. The only sign for months was the name of the construction company. So I was excited when I saw a ‘Coming Soon’ sign. I am not exaggerating in any way when I say that when I saw who was moving in that I let out a disgruntled and dissatisfied half groan/half growl. It was a visceral reaction. This has not happened to me before – so that speaks volumes for how I feel about this company. Do you have a guess of what they could be building? A Chick-fil-A! 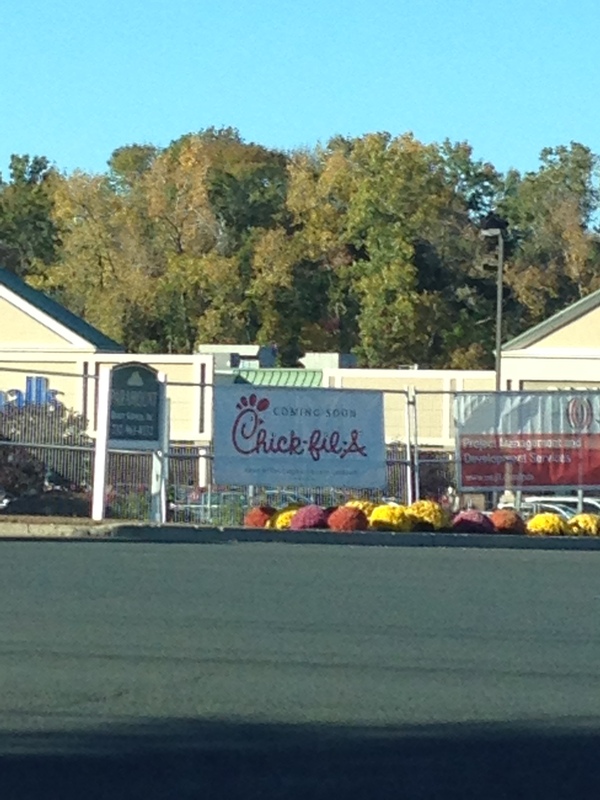 Seeing that a Chick-fil-A was moving into my neighborhood caused an actual guttural reaction. I am so disappointed in my town to see this hate filled company moving into our neighborhood. I’m still upset just writing this now. One of my best friends lives in Rhode Island and shared with me that when the Chick-fil-A moved in near her there were a lot of people protesting. I haven’t seen protesters in my area yet but part of me thinks I might be the one who starts it. That’s how opposed to this organization I am. There are very few companies that prompt this kind of reaction from me. The others shall remain nameless for right now as we focus on this monstrosity. Chick-fil-A has a strong reputation for being anti-LGBT and not being afraid to talk about it. This is the kind of company that gives true Christians a bad rap. I don’t often talk about LGBT and religion because it is a hot button issue. But I can say that I do know many good Christian people who are pro-LGBT and quite amazing people, so this is not my attempt to tarnish Christians across the board because that’s not how I feel. I respect those who respect me. It’s a very simple concept. Chick-fil-A is the kind of company the hides behind the cloak of religion. The cloak where they feel they can justify their bigotry and hatred because their faith tells them they can. As an LGBT consumer there is no way on earth I would ever walk into a Chick-fil-A and I know many people who will not either. 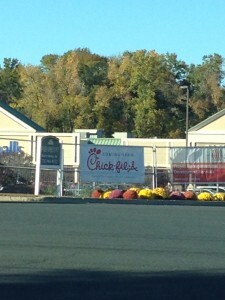 So what do you do when a Chick-fil-A moves in and they hate the LGBT community? 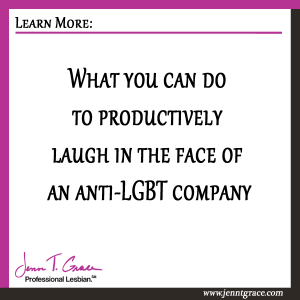 You can productively laugh in their faces. 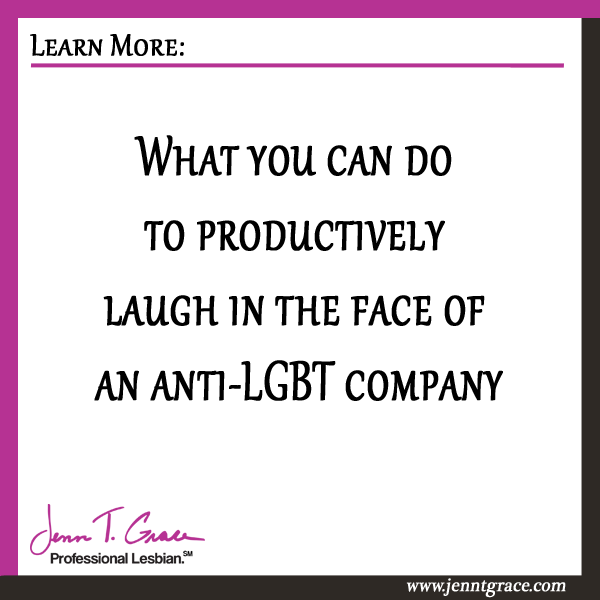 I have a wonderful story that I heard when I was at a Business Equality Conference back in October. A Chick-fil-A moved on to the University of Missouri at Kansas City* campus. On the actual campus not near just near it. The students were aware of how hate filled this company was and decided to take matters into their own hands. They decided to donate proceeds from that Chick-fil-A location on their campus to their school’s LGBT student group. When I heard this I had a gleeful reaction. I thought – wow, what a way to express to the company how you feel. While yes the school is donating their own profits to their own LGBT organization – they are still sending a message. A message that says we don’t agree with your hate filled ways so we are going to turn this negative situation into something positive. I walked away from that conversation with such utter enjoyment. Now I think of that story as I pass the Chick-fil-A in my town and I hope you do too! * I would like to note that I did not do further research on this situation and took the person I was speaking to at face value. If you find that some of this information is inaccurate, by all means please post an update in the comments below. I love good data!